Why: To make a louder guitar that was less expensive than the tricone resonator guitar. Worked with: John Dopyera (Patent was in George Beauchamp's name but John Dopyera was probably the true inventor). Who invented the first single cone resonator guitar? The answer to this question led to considerable anomisity among the likely candidates and even law suits. George Beauchamp applied for and was granted a patent (#1,808,756) for this invention. He was one of the founders of the National String Instrument Corporation. It was his search for a louder guitar that led John Dopyera, the another founder of National, to invent the first resonator guitar, the tricone. The patent application is cause for much of the questions about George’s contribution. First, National was already making single cone ukeleles and mandolins – it thus seems that the originality of the patent is questionable. Then there is George Beauchamp. He was not an inventor and was never seen on the factory floor at National. How could he of invented anything? Finally, John Dopyera claimed the single cone resonator was a design he tried and rejected because it didn’t meet his criteria for a guitar. The theory in Bob Brozman’s book The History and Artistry of National Resonator Instruments (Book) is that Geroge Beauchamp in fact took John Dopyera’s discarded designs and submitted them to the patent office as is own, without asking John Dopyera. 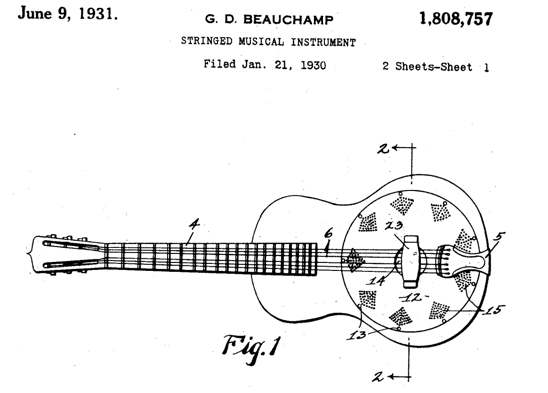 However, George Beauchamp was an important innovator in the development of modern guitars. Whether he invented the single cone resonator guitar or not, his insight that this was a commercially viable instrument saved the National String Instrument Corporation from bankruptcy during the depression. The tricone guitar was expensive to build and expensive to buy. It was always made from German Silver (a plating process) on a brass metal body. Only successful musicians could afford the tricone and the market quickly became saturated. 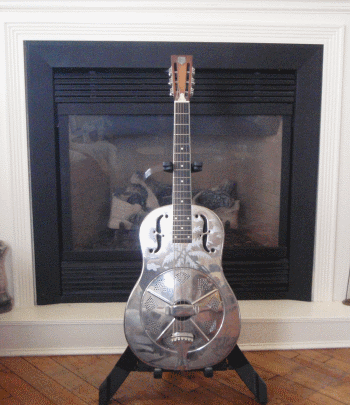 The single cone resonator guitar was made with a variety of bodies including Nickel plated brass (Style O), wood and steel. Another lesson that can be seen from this example is how inventors can sometimes be out of touch with what consumers might find useful 1. John Dopyera was a musician and a perfectionist. He no doubt rejected the single cone design in part because of the tremendous dynamic range of the guitar. It can be boomy. The ideal instrument to John Dopyera would have a nicely balanced sound. However, the considerations of many guitarists of the time were probably that the guitar should first be loud and then not too expensive. Some, such as blues guitarists who found the single cone resonator an excellent instrument, probably thought an added benefit was that the guitar was very expressive. Important musicians who have played Style O resonator guitars are Bukka White, Son House and perhaps the artist most responsible for awareness of resonator guitars in recent years, Mark Knopfler. Mark’s 1936 14-fret Style O was pictured on the album cover for Brothers In Arms. My first career was as an industrial scientist doing new product development. I can relate to this problem. Of course it never applied to my work.